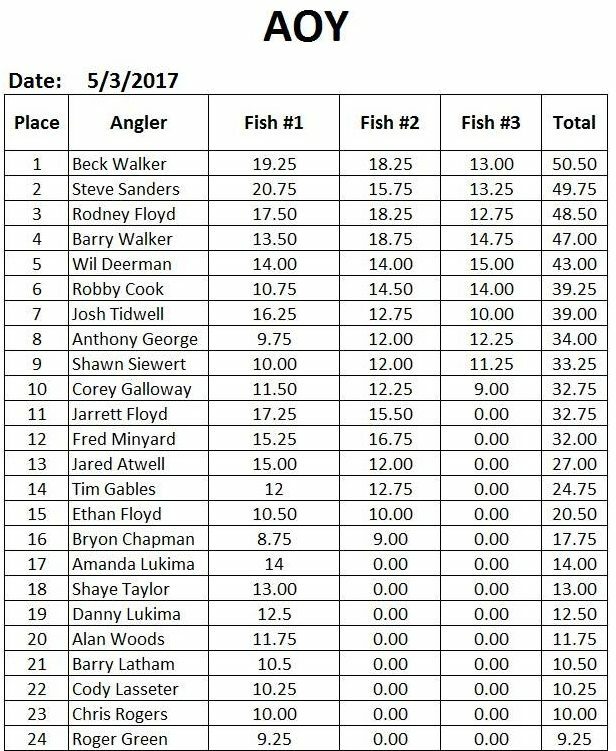 22 anglers showed up to fish the Wednesday night tournament held by the Coosa River Kayak Anglers. Fred Minyard took first place with a 32-inch two fish stringer. The Coosa River Kayak Anglers seem to have great turnouts during their evening quick events with their attendance rivaling many weekend tournaments. In fact, most of the CRKA events will be evening tournaments held during the weekday. Full results from last night’s event can be found here. This event factors into the CRKA Angler of the Year race. Here are the latest standings according to CRKA. It isn’t too late to get involved with CRKA or the other clubs in Alabama. We’re tracking dozens of other kayak fishing events to take place in Alabama.